BoardGaming.com> Games> Party Games> Are You A Werewolf? NOTE: Looney Labs also produced a Deluxe Edition of Are You A Werewolf? as a Kickstarter project, which was fulfilled in March 2013. That version is not generally commercially available. Given the very modern proliferation of ‘hidden identity and deduction’ games, from The Resistance and Avalon to Nosferatu and Ultimate Werewolf, it is a surprise to see the original game that they are based upon back in print. Of course, Are you a Werewolf? is not even the original version of that game—as the rather interesting History* of the game will testify—but it is the source from which many other games have sprung. 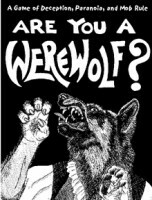 Originally published by Looney Labs in 2001, the question is, can Are you a Werewolf? stand up in the face of so many hidden identity come latelies? *Did you read the history yet? If not, why not? Personally I think it more interesting than this review. Are you a Werewolf? is described as ‘A Game of Deception, Paranoia, and Mob Rule’ and is designed for between seven and sixteen players. It takes place in a village at a time when pitchforks and torches are de rigeur fashion items and a lynching is a seen as a good day out, more so because the village is beset by werewolves! The villagers know that there are werewolves amongst their number, but not who they are. Fortunately they have amongst their number an ancient wise woman who is a Seer capable of identifying werewolves. Unfortunately the villagers are stubbornly superstitious and know that the best way of de-werewolving the village is to lynch someone in the morning—and if that just happens to be the wise old woman who is also the Seer, well she deserved it because everyone knew that she could float like a duck, right? The game consists of twenty cards and a rules leaflet, all done in black and white. Play requires a Moderator who receives the Moderator card and whose job it is to regulate the phases of the game as they pass from Night to Day to Night, and so on. Bar some blank cards, the remaining cards are identity cards consisting of one Seer card and two Werewolf cards with all of the rest being Villager cards. These cards are handed out, one to each player who keeps them secret from the other inhabitants of the village. They will include both the Seer card and the Werewolf cards. The aim of the game for the Villager players is to identify (and lynch) the Werewolf players before the lycanthropes can overwhelm the village and eat everyone, whilst the aim of the Werewolf players is to keep their identities very, very secret, and not so not get lynched whilst snacking on a Villager each and every night. If this involves eating the Seer, then they will have an advantage. Her aim is to help the Villagers identify the Werewolves, but she must keep her identity secret because if the Werewolves identify her, then she will be the their target on the next night and without her, identifying the Werewolves is a whole lot more challenging! Are you a Werewolf? is simple to play. Each Night the two Werewolves confer and select a Villager to chomp down on whilst the Seer learns the Secret Identity of one other player, be it Villager or Werewolf. Then in the Morning, everyone in the Village wakes up and discovers the dead player and what his Secret Identity is—that player is also out of the game. The remaining Villagers—which of course include the surviving Werewolves—must vote as to which one of their number they believe to be a Werewolf and needs lynching, and it is here that the mob rules. The victimised player must reveal his Secret identity and he too, is also out of the game. All of this is monitored and marshalled by the Moderator. He has a little script which he reads out in order to keep the fear and loathing organised and running along nicely. Are you a Werewolf? is a light game of bluff and deduction combined with desperate persuasion that is easy enough to throw into a bag when going to a convention or any big social gathering or party. It works equally as well with non-gamers as it does with gamers because its rules are simple, the preparation time is minimal, and its theme is highly accessible—after all, everyone has seen a classic horror movie or two and with Are you a Werewolf?, the players get to be in their own horror movie! Indeed, playing Are you a Werewolf? gives everyone the chance to act (or roleplay) as much as they want and that can be as much part of the game as the deduction and the bluffing. Physically, Are you a Werewolf? is very simple, being nothing more than a set of black and white cards and a small rulesheet. The latter expands a little upon the game play and gives some advice, but to be honest, the game’s rules would fit on one of its cards. Playing Are you a Werewolf? is fun and the more you put into it, the more that you get out of it. If it has a fault, it is the elimination aspect of the game, but that is the point of it, plus the Moderator should really keep things moving lest they bog down and drag the game out. There is a place on your gaming shelf for Are you a Werewolf? It is simple, it is elegant, and it handles larger groups than most games. Whilst many titles since have offered greater sophistication and retheming, Are you a Werewolf? offers a stripped back, more desperate playing experience. Add a Review for "Are You A Werewolf?"  Are You A Werewolf?